Last week was my first time in Chicago (minus many layovers in the airport). 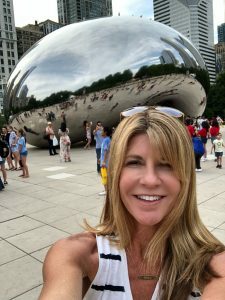 My colleagues and I were attending the Midwest Dreamin’ at the Palmer House Hilton right in the beautiful Theatre District and close enough to Cloud Gate “The Bean” for me to get a selfie. One of the special takeaways was learning about Pep Up Tech. 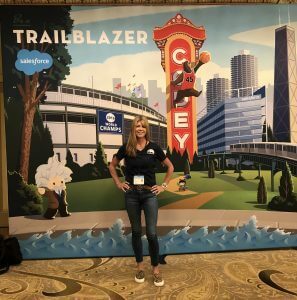 Pep Up Tech was founded in 2016 by some pretty awesome Salesforce Trailblazers that saw the need to bring technology programs to underserved students. Their initiative has benefited thousands of young people with programs that include a Salesforce Bootcamp. It was great to see Salesforce embracing this and a true partner in their quest. Now a recap of Midwest Dreamin’ from my perspective. This was my first time at Midwest Dreamin’ and our first time as Metazoa. 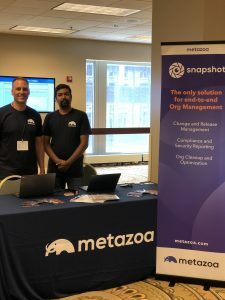 We were a company called DreamFactory before we spun off and rebranded as Metazoa with the same product called Snapshot. With the rebranding, we also rebuilt Snapshot and now call it Snapshot 2.0. As DreamFactory, we had participated in this event at least once, and in fact, one of our team members had been there before. I was very impressed with the event. The organizers and team of volunteers are all top-notch. There were over 35 sponsors and over 700 in attendance. This event is a well-oiled machine with amazing talks and steady traffic. About 50% had already checked in on the first day which was only a half day and the reception on the first evening was an excellent opportunity to socialize and network. The second day, we had some significant traffic, and we also participated in the demo jam. Although we didn’t win the demo jam, many were in attendance which subsequently brought us a lot of intrigued visitors wanting to learn more about Snapshot. I wish I could say I attended the talks but I didn’t have time since I was manning a steady flow at the booth and meeting all the great people that attended. Here is a recap of a couple talks written by a new friend I made at the partner summit. Will we be going again next year? Heck yeah! Wouldn’t miss it! Aside from Dreamforce which we will be attending, we are also participating in Northeast Dreamin’ and Florida Dreamin’. Come to see us at these events and learn why Snapshot is the only end-to-end change and release management tool! Visit our website and our AppExchange listing to learn more about Snapshot.